A massive cyclonic storm late Tuesday night lashed most parts of Assam and other north-eastern states, including Guwahati – the gateway to the region. 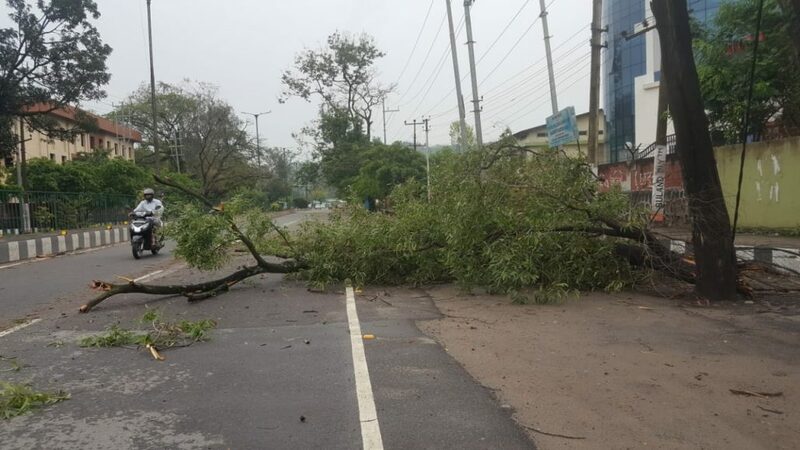 The cyclonic storm followed by heavy downpour left a trail of destruction across the State and region, not to speak of extensive damages across the city of Guwahati. The thunderstorm, which was accompanied by cyclonic winds, hit several parts of the State just past midnight. The strong wind had blown away several billboards across Guwahati apart from causing extensive damage to several bihu pandals put up across the capital city. Several trees were also uprooted across the city causing damage to parked vehicles. Most of the roads across Guwahati were strewn with torn branches and a blanket of leaves covered all over. The winds were so heavy and so harsh that several tinned roofs were blown away leaving people to spend the rest of the night under the open sky amid continuous rain that continued till early morning. 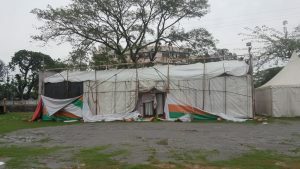 The Latasil Bihu pandal in Guwahati, where the much-anticipated state-level Bihu competition is scheduled to be held on Wednesday has been ravaged to the ground completely. Similar is the scene at the Chandmari and Maligaon bihu pandals. Unconfirmed reports from across the State have stated that several school buildings which were set up as polling stations for the second phase Lok Sabha polls on Thursday have also bore the brunt of the severe storm. With less than 24 hours left for polling, it remains to be seen how the voting goes off smoothly. Similar reports of cyclonic storm have also come in from several north-eastern states with maximum havoc unleashed in Meghalaya and Mizoram.